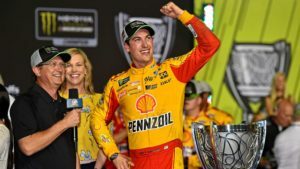 My how the time has flown, well just a little over a week that is since Joey Logano captured the 2018 NASCAR Monster Cup Series Championship trophy in Homestead. He has done the tradition tour of NYC, which has included a lot for the 28 year old star of Penske Racing. Those stops at Sports Illustrated, SiriusXM Radio and “Live with Kelly and Ryan” were just a few places during his media tour in the Big Apple. As we now come up on the final wrap up for Logano in Las Vegas at Champions Week, it may also be the last go round for NASCAR in Las Vegas as well. This will be the first year where just two events will take place during the event, the Myers Brothers Luncheon on Wednesday and the Awards Show from the WYNN on Thursday evening at 8pm EST and 5PM PCT. One of the most notable missing parts of the Champions Week will be the parade of cars on the Las Vegas Strip. While the cars took the strip earlier in the year as part of the second race held at LVMS, this has been a part of the Champions week that fans have flown from all around to take part in. It was almost like second race weekend in Vegas with the amount of spectators on hand for a 20 minute victory lap. The other missing part this year will be Jimmie Johnson as part of the Championship pack of drivers appearing, Johnson failed to qualify for the final four drivers and the fan favorite is also leaving his car along with sponsors for next season. The end of LOWES and Johnson as we knew it in Vegas for years. For Logano, this is a dream come true and like Mark Martin said when Logano was 15, he is the best thing since sliced bread, here he is about the break bread and maybe a few bottle of champagne in Vegas to celebrate his championship.